Parathyroid hormone maintains the body’s calcium levels by increasing the absorption of calcium from the bones, kidneys, and GI tract. Parathyroid hormone works in concert with another hormone, calcitonin, that is produced by the thyroid to maintain blood calcium levels. Parathyroid hormone acts to increase blood calcium levels, while calcitonin acts to decrease blood calcium levels. When blood calcium levels drop below a certain point, calcium-sensing receptors in the parathyroid gland are activated, and the parathyroid glands release parathyroid hormone into the blood. PTH acts on the bone to increase blood calcium levels by stimulating osteoclasts to break down bone and release calcium into the bloodstream; on the GI tract to increase the activity of the enzyme in the intestines that activates vitamin D; and on the kidneys to promote calcium reabsorption. vitamin D: A fat-soluble vitamin required for normal bone development and that prevents rickets; it can be manufactured in the skin on exposure to sunlight. osteoclast: A large multinuclear cell associated with the break down and resorption of bone. bone remodeling: The resorption by osteoclasts and replacement by osteoblasts in bones. The parathyroid glands are small, pea-sized endocrine glands located on the rear side of the thyroid gland. The major function of the parathyroid glands is to maintain the body’s calcium level within a very narrow range, so that the nervous and muscular systems, which depend on calcium to transmit action potentials, can function properly. When blood calcium levels drop below a certain point, the calcium-sensing receptors in the parathyroid gland are activated, and the parathyroid glands release parathyroid hormone (PTH) into the blood. PTH is a small protein hormone that is integral to the regulation of the level of calcium in the blood via the bone, kidneys, and intestines. PTH works in concert with another hormone, calcitonin, that is produced by the thyroid to maintain calcium homoeostasis. Parathyroid hormone acts to increase blood calcium levels, while calcitonin acts to decrease blood calcium levels. This interaction between parathyroid hormone and calcitonin is also an important part of bone remodeling. This is a lifelong process where mature bone tissue is removed from the skeleton and new bone tissue is formed. 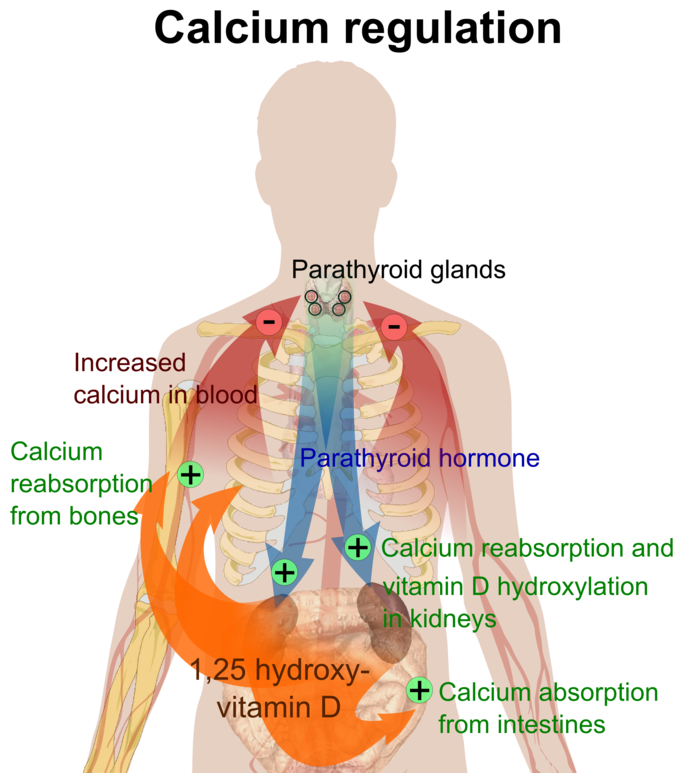 Calcium regulation: Parathyroid hormone regulates the levels of calcium in the blood. to the parathyroid glands. Parathyroid hormone acts on a bone to increase its blood calcium levels by stimulating osteoclasts to break down bone and release calcium into the bloodstream. Parathyroid hormone acts on the gastrointestinal tract to increase blood calcium by increasing the activity of the enzyme in the intestines that activates vitamin D.
It acts on the kidneys to increase blood calcium levels by promoting calcium reabsorption in the nephrons.